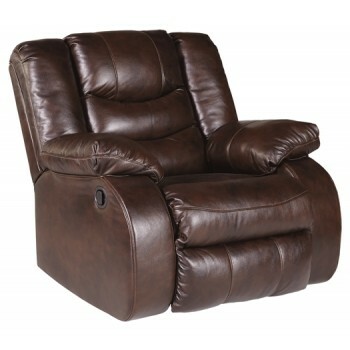 This rocker recliner has a timeless appeal that the whole family can appreciate. From Grandpa to Grandson, everyone will enjoy the deep seating with overstuffed cushions. Supple top-grain leather on the seating area wraps around your body for a luxurious feel. Skillfully matched leather-like fabric covers the back and sides. Easily recline in infinite positions of comfort. This recliner puts the family in family spaces.